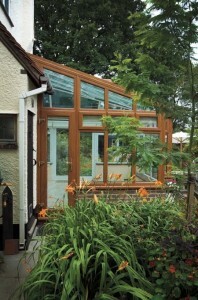 Often referred to as a sunroom or garden room, lean-to conservatories bring a taste of the Mediterranean to your home. Traditional or contemporary, this style is ideal for properties with limited space under the eaves or an awkward area in which to fit a conservatory. The pitch of the roof is variable, so that a shallow pitch could fit under a low bungalow roof, whilst a steeper pitch would match the roof of a terraced house. Dating as far back as the Georgian era, the lean-to has evolved from a functional greenhouse protecting delicate plants and vegetables from the harsh British winters to an elegant extension where during the long summer days one can relax and enjoy its wonderful peaceful environment. With its distinct single pitched roof and rectangular shape this conservatory is ideal for any dwelling from the traditional manor house to the modern day bungalow. The lean-to style conservatory has a vast range of options which can be personalised to suit every situation and circumstances.